A box of tummy-flutteringly wondrous munchy things. 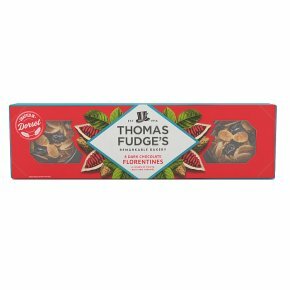 Suitable for vegetarians.Decadent Belgian Dark Chocolate Florentines A wondrous amalgam of fruit, almonds, stem ginger and sticky caramel, dipped in rich Belgian dark chocolate. Is it an indulgent French biscuit to be munched at high tea with friends? Or a naughty treat to savour after dinner, with a glass of sweet wine? Jolly well try both!